One of the cheapest and easiest ways of travelling through Colombia is by bus. If you want to save some money, taking the bus from one town to the other is the best option. Also, in recent years, the roads have been improved exponentially. So, aside from enjoying the scenery, you’ll have a pretty comfortable trip. However, the quality of the trip also depends on the bus company. 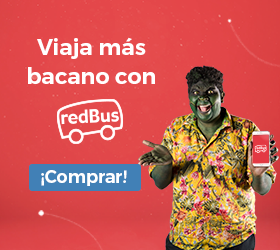 Surely, you’ll want a reputable and good bus company. 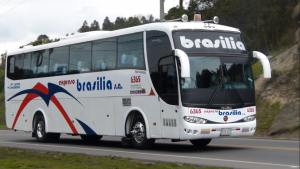 To make your life easier, here’s a list with the 5 best bus companies in Colombia. What makes a good bus company? The coverage around the country, the range of prices and the quality of their fleet, among other things. Expreso Brasilia, founded in 1961, meets all the conditions. The routes cover almost every part of Colombia (over 1000 destinations) and the prices go from less than 5 dollars to 50 dollars, depending on the destination. Depending on your budget and your needs, you can take an express bus with basic amenities (TV, reclining chairs and bathroom) or a premium bus (with individual screens and headphones, WiFi, refreshments and movies on board). You can look for tickets right here. Founded in 1956, this is one of the companies you’ll see everywhere. 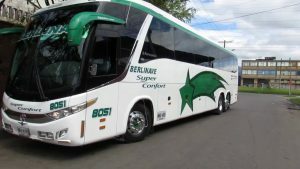 Expreso Bolivariano covers close to 75% of Colombian routes and they have a strong bet on luxury buses. 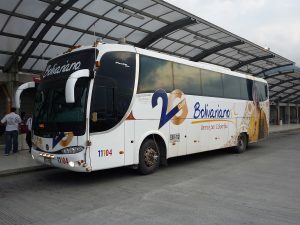 With their online services and frequent user plan, Expreso Bolivariano sometimes offers discounts up to 40%.Their latest innovation are the TecnoVANS, a service for short trips inside vans with screen for each passenger. Certainly, is all about comfort. If you want to know more about Expreso Bolivariano, click here. Founded in Medellin, its first route covered the journey between Medellin and Barranquilla. Now, 60 years later, Rapido Ochoa specializes in covering the most important cities in Colombia. Its main destinations are Bogota, Medellin, Cartagena and Santa Marta. 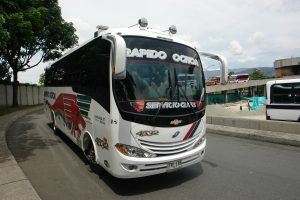 While the fleet is smaller than other companies, it has other services such as touristic plans, such as the tour around small towns in Medellin: Santa Fe de Antioquia, Jardin y Jerico. Here you can find tickets for major Colombian cities and here you can arrange a tour. The oldest bus company in Colombia, founded in 1942, is also one of the best. The initial 22 partners (all from transporter families) started making routes from Santander to both the inside of the country and the Caribbean: Cartagena, Barranquilla and Santa Marta. The fleet has five types of buses: three with regular services, one luxury and one two floor bus, which has amenities such as ergonomic chairs in the first floor, two bathrooms, WiFi, movies on board and individual screen. Copetran has more than 100 destinations and the prices range. You can for tickets for each one of these destinations right here. San Gil, Santander, is the birthplace of this bus company. Since 1954, Berlinas -their short name- has focused on a specialized service with few destinations. Nowadays, Berlinas has seven destinations: Barranquilla, Bogota, Bucaramanga, Cartagena, Cucuta, Pamplona and Santa Marta. While it has less destinations than other companies, it offers high-end buses with armchairs, AC, exclusive bathrooms, WiFi, electric outlets and refreshments. If you’re interested on any of the destinations that Berlinas offers, click here. 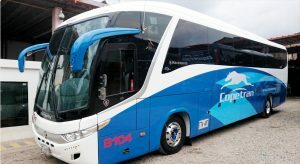 Copetran bus company review : the old ways are still the best!